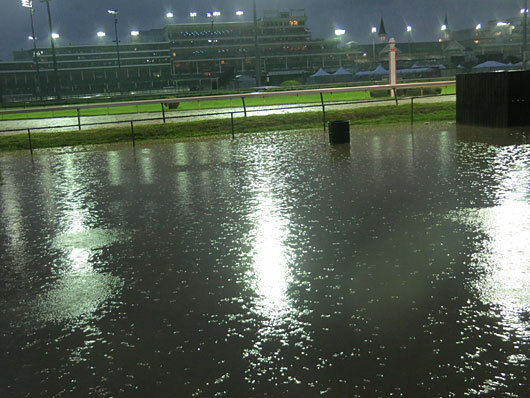 There are heavy rains, torrential rains, and the rain that all but drowned Churchill Downs Monday morning. The lightning came fast and furious; one bolt knocked out light, and the flooding came just as fast. Some of the thunder claps were so loud and strong, several horses became noticeably spooked. But not at Todd Pletcher’s barn, where “spooked” and “upset” are not acceptable words. 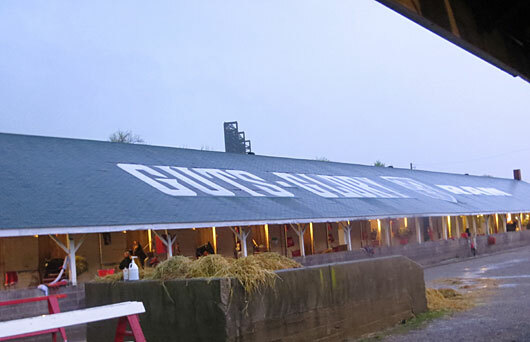 The serenity of Pletcher’s barn supersedes all. 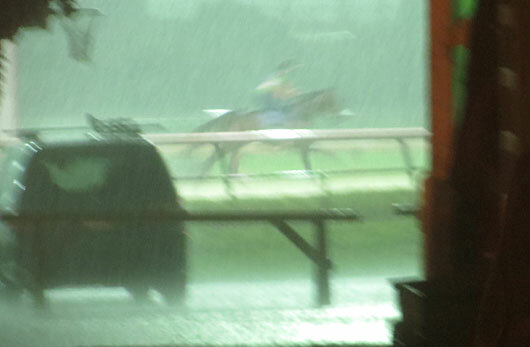 Pletcher jogged his four Derby workers from Sunday, and Danza, Intense Holiday, Vinceremos, and We Miss Artie all returned to the barn just as the skies opened up. All of them calmly walked the shed and were unfazed by the light show outside and the crashing of thunder. Over at Bob Baffert’s barn, not even a biblical storm was enough to stop Baffert from sending out Hoppertunity for a half-mile breeze. Baffert arrived at about 6:30 and was joined by his brother Bill and Hoppertunity’s owners Mike Pegram, Paul Weitman, and Karl Watson. The question was what to do about the work? Baffert had been fretting about it and had contemplated waiting for Tuesday and hoping for a good track. 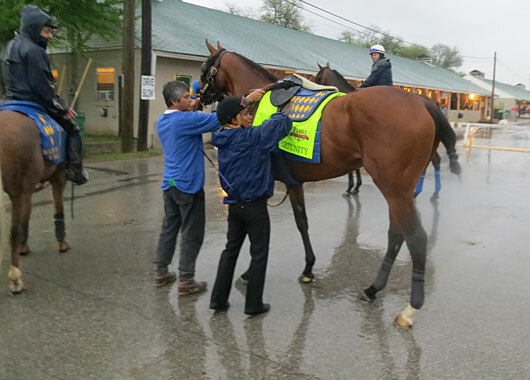 But when the heavy rain dissipated to a light shower and the lightning moved off and the loose track from yesterday had actually become packed down, Baffert decided to use the window of opportunity, or Hoppertunity, to work his colt over a track that somehow was in pretty good shape. Hoppertunity was saddled up and got ready to head to the track accompanied by Baffert’s favorite workmate Drill, who had uncharacteristically flubbed his assignment last time and provided no help as a prompter. So this was an important test for the colt. Jockey Martin Garcia returned from his work aboard Kentucky Oaks contender Ria Antonia and hopped right on Hoppertunity. As they were making their way to the track, Garcia jumped off to adjust the colt’s saddle equipment, and then was given a leg back up by trainer Phil Thomas. Baffert’s move proved once again why he has such a keen eye and sense of timing, as Hoppertunity turned in a solid half-mile breeze in :48, breaking off a couple of lengths behind Drill. 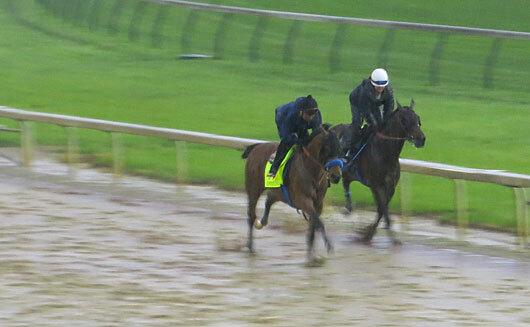 Hoppertunity was well out toward the middle of the track, while Drill remained down on the rail. Hoppertunity eased back toward the inside to engage Drill and the pair came home together and galloped out very strong as a team until Hoppertunity began to ease clear down the backstretch. Garcia returned beaming, saying Hoppertunity felt like “a million dollars,” adding that he was just galloping the entire way and was playing with Drill. Baffert stepped out of car with a broad grin on his face. “How about that Drill?” he said, thrilled that the speedy Drill was back to his old self and was able to provide the necessary competition for Hoppertunity. So Baffert not only got in his work, he got in a terrific work that can allow him to now relax and enjoy the festivities of Derby Week with brother Bill, his one-man entourage Bernie Schiappa (co-owner of Game On Dude), and Pegram, Weitman, and Watson. No one knows how to enjoy Derby week more than that bunch. Earlier in the morning, Steve Asmussen sent out Tapiture for a half-mile breeze in :50, which the colt accomplished in a driving rain. 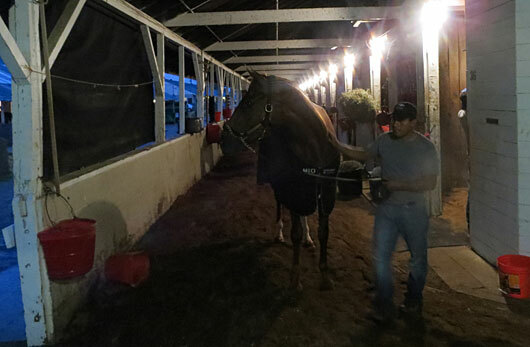 Mike Maker switched schedules this morning, and because Vicar’s in Trouble and Harry’s Holiday were only jogging, Maker decided to wait to see how the track was before sending General a Rod out for his gallop. 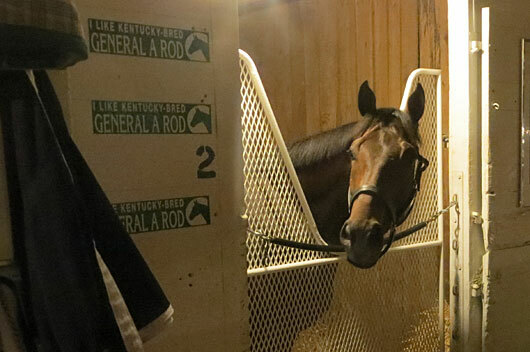 The colt seemed perplexed by the change and was getting fidgety in his stall, trying to nail anyone who walked by. General a Rod finally did go out just before Hoppertunity worked. He most likely will have his final Derby work tomorrow, with Wednesday being an option if the track is in bad shape. Uncle Sigh had an easy gallop in blinkers. He will wear them in the Derby, and although a major equipment change in the Derby is something that many frown upon, this colt did look awfully good working in them several days ago, and he has the disposition to avoid falling victim to whatever it was that lit an uncontrollable fire under Palace Malice last year with first-time blinkers. Because there was so little activity this morning, I will cut this a bit short and head back to the track to greet California Chrome and Dance With Fate, who are scheduled to arrive from California early in the afternoon. 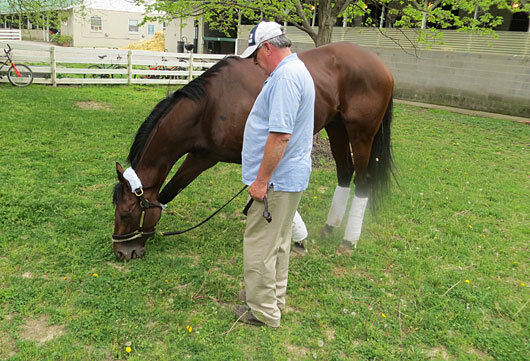 On Sunday afternoon, trainer Jimmy Jerkens, after having scouted out the immediate area, took Wicked Strong out to graze outside Lynn Whiting’s barn, the only available grass close by. Although the colt used to be a nervous type and didn’t carry much weight, grazing seems to have helped him, and he was calm and relaxed throughout. Jerkens said he’s put on weight and is much more robust now. 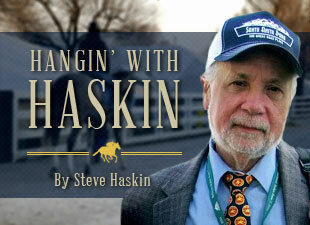 All photos are by Steve Haskin, please ask before taking.